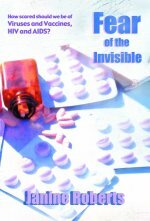 Fear of the Invisible is a book by Janine Roberts that takes a deep look into the world of virus isolation and vaccine manufacture. It appears that isolation of a virus is not a clean-cut business, nor is the evidence that these little fragments of information from our cells' DNA actually do cause disease. Since the data puts the causation of polio, the flu, and even aids into doubt, the advisability of vaccination as a practice to prevent "viral diseases" loses much of its appeal as a public health measure. The book "takes its readers on a journey into the very heart of the hunt for viruses – to the key experiments performed to prove that these invisibly small particles cause diseases that often were previously blamed on toxins or bacteria. It sheds light on the extraordinary assumptions underlying much of this research into viruses – and the resulting vaccines and antiviral medicines." As an example of what passes for virology, the science of viral illnesses, on which rests the whole edifice of a multi-billion dollar vaccine industry and the 'preventive strategy' of much of western medicine, Martin Barnes has summarized a chapter of the book that details the scientific history of polio. You may be amazed at some of the mind boggling blunders that are at the basis of the 'science' of vaccines. But to get the full story, do buy the book and if you are able to, spread the word. We need honesty in medicine! This summary was created from information extracted from Janine Roberts' book 'Fear of the Invisible' (Impact Investigative Media Productions, 2008). They ground up the spinal cord of a 9-year-old polio victim and injected a cup of the suspension directly into the brains of two monkeys. One died immediately and the other slowly became paralyzed. Ground up human spinal cord with polio and injected the suspension directly into a monkey's brain, the monkey became paralyzed, then they extracted some fluid from its brain, and injected it into another monkey's brain, and so on through a series of monkeys paralyzing all of them in the process. But making the monkeys drink the liquid or injecting into their arms did not paralyze them. However, the scientists were under a lot of pressure then to find a cure for the waves of polio hitting middle class kids in the summertime. Took excrement from a polio victim and prepared a 20% suspension with ether and centrifugation, then injected it directly into the living brains of suckling mice 3-7 days old. They became paralyzed. 1949: Enders of Harvard claims he can make this 'virus' from human embryonic cells, making it far easier to make a vaccine. (Gut enteroviruses like this are very common in humans. We all have many of them. 1951: Scientists report they cannot find the designated polio virus in many polio victims. 1952: Prof Konstantine Vinodouroff of the Institute of Neurology, Russian Academy of Medical Science, tells the Americans that Russia has never had an outbreak of polio. The Americans are amazed. The 'poliovaccine' is administered as a safety test to 400,000 US children. The official safety report stated that it protected '30-90 percent' of recipients. 1955: Salk distributed his vaccine 'seed' —derived from the excrement of healthy children— to manufacturers. The next step was to sprinkle it into vast quantities of minced monkey kidneys and allow the virus to multiply, then add formaldehyde to kill it. They made 27,000,000 vaccination doses. 1955: President Dwight Eisenhower awarded Salk the Congressional Medal declaring the polio vaccine a great victory for American science. 1956: Health Authorities change the rules for defining polio. Doctors are instructed to diagnose polio only if the patient has paralytic symptoms for 60 days or more. Milder cases of polio are no longer reported. 1958: CDC changes the rules for defining polio again. Cases of inflammation of the membrane that protects the brain and spinal neuron cells, causing muscular weakness and pain, but not paralysis, are no longer to be classified as polio. These cases must now be called viral or aseptic meningitis. Non-paralytic cases were now to be re-named meningitis even if the polio virus is present. The reported figures for polio were officially to exclude 'cases of aseptic meningitis due to polio virus or other entero viruses.' Reported cases of aseptic meningitis went from near zero to thousands, and polio cases dropped the same amount. 1958: Officials reduce the definition of polio again. Now all cases with classic polio paralytic symptoms are to be diagnosed initially as Acute Flaccid Paralysis (AFP). Two turds are taken from the patient and sent to the CDC to see if they can find polio in them. If not, they are declared as not polio, even if the children have all the classic symptoms. 1958: Officials triumphantly declared large parts of the world polio free, even while the newly defined Acute Flaccid Paralysis (AFP) suddenly became common. Credit for this great victory over disease was given to Salk, Sabin and the vaccine manufactures. Report in JAMA Feb 25, 1961: "It is now generally recognized that much of the Salk vaccine used in the U.S. has been worthless." Live strains produced by Sabin and put in sugar cubes were adopted instead. 2008: Ordinary doctors still do not have the power to diagnose polio by observing symptoms. The World Health Organization still demands that two turds from each victim of infantile paralysis be sent to their laboratories. If no polio virus is found in these, the cases are declared not to be polio, even if these children are suffering from the same severe paralysis symptoms and pain as found in the worst cases of polio during the American epidemics. Question: Could something else be causing polio besides the virus? Finding the polio virus in human excrement is natural, and finding it there does not prove it causes polio, symptoms of paralysis in the motor neuron cells of the backbone. 2008: On the CDC website Dr. John Lienhard explains that too much hygiene was the cause of the polio epidemics. Most kids pick up the virus in garden soil and become naturally immune to it, but not the kids subjected to the overly hygienic parents of the 50's. Conclusion: The effectiveness of the Salk vaccine (and Sabin live vaccine in sugar cubes) is something that we have all come to accept, but it is nothing more than a scientific myth, fraudulently promoted by the political and medical authorities of the time, and still believed today. Millions of polio vaccine injections are still given worldwide every year for essentially no purpose. Causation by a virus has not been shown. 1890: Lead arsenate pesticide started to be sprayed in the US up to 12 times every summer to kill codling moth on apple crops. 1892: Polio outbreaks began to occur in Vermont, an apple growing region. In his report the Government Inspector Dr. Charles Caverly noted that parents reported that some children fell ill after eating fruit. He stated that 'infantile paralysis usually occurred in families with more than one child, and as no efforts were made at isolation it was very certain it was non-contagious' (with only one child in the family having been struck). 1907: Calcium arsenate comes into use primarily on cotton crops. 1908: In a Massachusetts town with three cotton mills and apple orchards, 69 children suddenly fell ill with infantile paralysis. 1909: The UK bans apple imports from the States because of heavy lead arsenate residues. 1921: Franklin D. Roosevelt develops polio after swimming in Bay of Fundy, New Brunswick. Toxicity of water may have been due to pollution run-off. 1943: DDT is introduced, a neurotoxic pesticide. Over the next several years it comes into widespread use in American households. For example, wall paper impregnated with DDT was placed in children's bedrooms. 1943: A polio epidemic in the UK town of Broadstairs, Kent is linked to a local dairy where cows were washed down with DDT. 1944: Albert Sabin reports that a major cause of sickness and death of American troops based in the Philippines was poliomyelitis. US military camps there were sprayed daily with DDT to kill mosquitos. Neighboring Philippine settlements were not affected. 1944: NIH reports that DDT damages the same anterior horn cells that are damaged in infantile paralysis. 1946: Gebhaedt shows polio seasonality correlates with fruit harvest. 1950: US Public Health Industrial Hygiene Medical Director, J.G. Townsend, notes the similarity between parathion poisoning and polio and believes that some polio might be caused by eating fruits or vegetables with parathion residues. 1950: Dr. Biskind presents evidence to the US Congress that pesticides were the major cause of polio epidemics. He is joined by Dr. Ralph Scobey who reported he found clear evidence of poisoning when analyzing chemical traces in the blood of polio victims. Comment: This was a no no. The viral causation theory was not something to be questioned. The careers of prominent virologists and health authorities were threatened. Biskind and Scobey's ideas were subjected to ridicule. 1953: Clothes are moth-proofed by washing them in EQ-53, a formula containing DDT. 1954: Legislation recognizing the dangers of persistent pesticides is enacted, and a phase out of DDT in the US accelerates along with a shift of sales of DDT to third world countries. 1962: Rachel Carson's Silent Spring is published. 1968: DDT registration cancelled for the US. 2008: Acute Flaccid Paralysis (AFP) is still a raging, but little mentioned, epidemic in many parts of the world where pesticide use is high, and DDT is still used. Conclusion: Modern belief that polio is caused by a virus is an ongoing tragedy for the children - poisoning victims - involved. Public funds are wasted on useless and dangerous vaccines when the children could be treated with antitoxins. 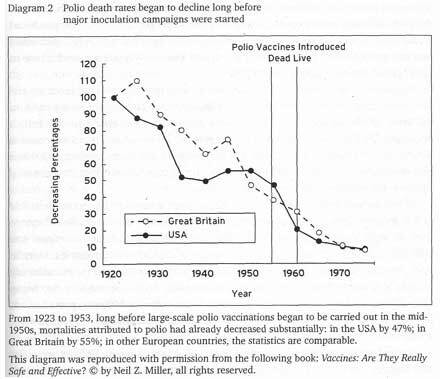 This graph shows that polio death rates were already in steep decline when polio vaccines were started. This directly throws into question the effectiveness of the vaccines. I agree - disease is not caused by viruses, and germs are not the bad guys here, but rather toxins - but I still believe chronic exposure to manmade electromagnetic and microwave fields is somehow involved in ALL disease. this article is just fantastic. I am the son of the Head of Allied Chemical's RD for Fungicides, Pesticides, herbacides, Insecticides. I can tell you my Father loved people, but thought DDT was safe. I have always suspected this type of info but had not searched for it. I spent a year investigating Cancer. maybe this would really change the world for the better..